School mornings can be rough! Between getting the kids up, getting everyone dressed, and gathering up books, pencils, lunches, and backpacks, it can be a trial fitting breakfast in before everyone hurries off on their separate ways. You’d think that mornings would be easier for a homeschool family, but I’ve learned that’s not the case. We still struggle to get started on time so that everyone can get finished before whatever afternoon activities are happening, and it’s all too easy to suddenly realize that it’s half-way to lunch and breakfast hasn’t happened. One way to fight the morning mayhem is to plan ahead and make double (or triple) recipes of your favorite breakfast food, and have it in the fridge or freezer for quick breakfasts all week long. I like to keep a stash of Paleo Pancakes in the freezer for mornings when we have time to sit down at the table (but not time to cook). Another quick favorite are these Blueberry Apple Oatmeal Muffins, sort of a bowl of oatmeal baked in a handy, ready-to-go muffin. Hard boil a dozen eggs and send your child to the bus stop with an egg and one of these hearty muffins…you’ll be confident that she’ll be good to go until lunch. I found this recipe at one of my favorite gluten free sources, the Gluten Free Goddess blog. I like it because you soak the oats in warm milk (coconut and almond milk work just as well as raw cow’s), which really gives the muffins a moist, tender crumb. 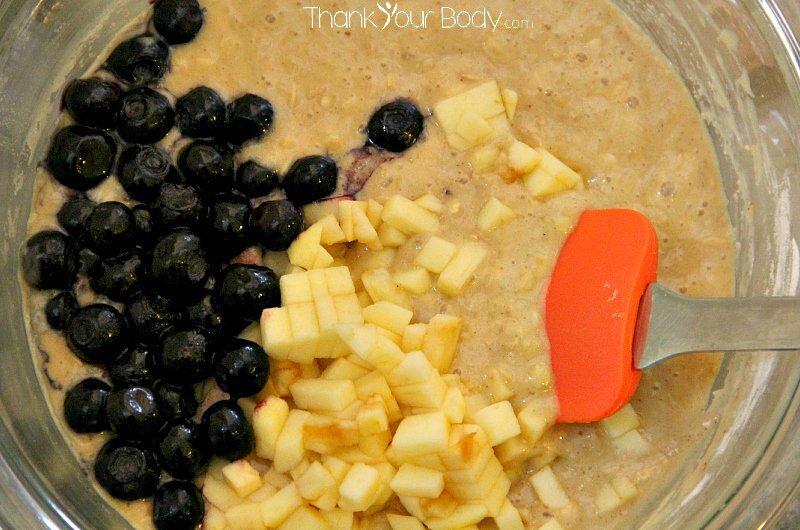 I added some fresh chopped apple, too…it’s a little like a bowl of oatmeal in muffin form! These are relatively low in sugar but high in taste, they have an excellent texture and the oatmeal really sticks to your ribs. First, warm up some milk and soak the oatmeal for at least 20 minutes. As it soaks, beat together coconut oil, vanilla, some brown sugar and honey. Whisk together a cup of gluten free flour (sorghum, oat, coconut or almond all work) with some aluminum-free baking soda, baking powder, and ground cinnamon. Add a bit of xanthan gum, chia seed or ground flax seed to the mixture as well, to prevent your muffins from being crumbly (if you’re using coconut or almond flour, this will be especially helpful). Now, just combine the soaked oats with the coconut oil mixture. Stir in the dry ingredients, and beat well. Add 2 beaten eggs, and stir until combined (you can add a bit of milk at this point if the mixture seems too dry). Finally, carefully fold in the blueberries and apples and spoon the batter into a muffin tin lined with organic, unbleached baking cups. For the topping, rub together some oats, organic brown sugar, cinnamon and coconut oil. Sprinkle this on top of the muffins before you pop them in the oven. Bake for 15-20 minutes and…Joy! Delicious and hearty muffins! Double or triple this recipe and keep the extras in an airtight container in the fridge, so you’ll have breakfast ready all week long. They’re a great addition to lunchboxes, too! These delicious gluten free blueberry apple oatmeal muffins are perfect for on the go breakfasts or a healthy snack. Adapted from this recipe. 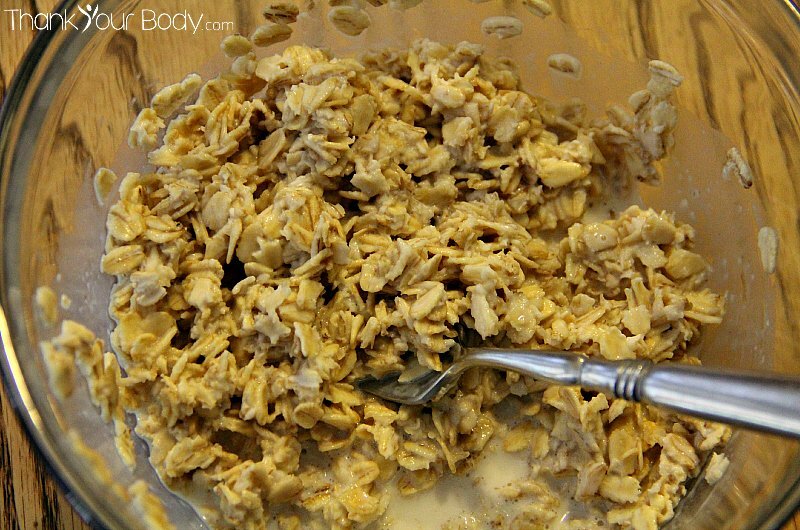 Heat the oats with the milk, set aside and let the oats soak. In a bowl, combine the coconut oil, sugar, vanilla, and maple syrup. Stir well to combine. In a different bowl, stir together the flour, baking soda, cinnamon, xanthan gum (or chia seed or ground flax) and baking powder. Add the soaked oats and milk to the coconut oil mixture and stir. Then add the dry ingredients a little at a time, stirring by hand to combine. Add the beaten eggs, and stir the batter well. Sprinkle in the blueberries and apples, then fold them carefully into the mixture to avoid smashing the berries. Prepare the topping by combining all topping ingredients and mashing them together with a fork. Sprinkle a little topping on each muffin. Bake for 15-20 minutes, until a toothpick inserted in the center comes out clean.